Preparing future homes to survive climate-induced shocks begins now. Builders face tough times. Each year brings more restrictive land use, rising material costs, stricter building codes (in some areas) and the ever-looming threat of litigation. Of course, sometimes the industry backs outdated ways of building (opposition to low-flow toilets a few years ago was not a high mark). But builder groups in California were right to resist a new bill that holds them responsible for the unpaid wages of their subcontractors’ employees. We need our best and brightest focused on what really matters—building high-performance housing—not fighting legal battles. Good building science is in every builder’s interest. The better a unit of housing performs, the greater its energy efficiency and ability to withstand nature’s fury, the more likely it will get built, stay intact and serve as a calling card with municipalities for future permitting and planning. In coming months, Green Builder will be doubling down on our commitment to the need for more resilient housing. It’s a natural fit with our sustainability mission. Resilient homes naturally waste less energy than their built-to-code-minimum counterparts. Keeping additional CO2 out of Earth’s atmosphere clearly serves dual purposes. It will help dampen global warming—and make homes safer and more durable. 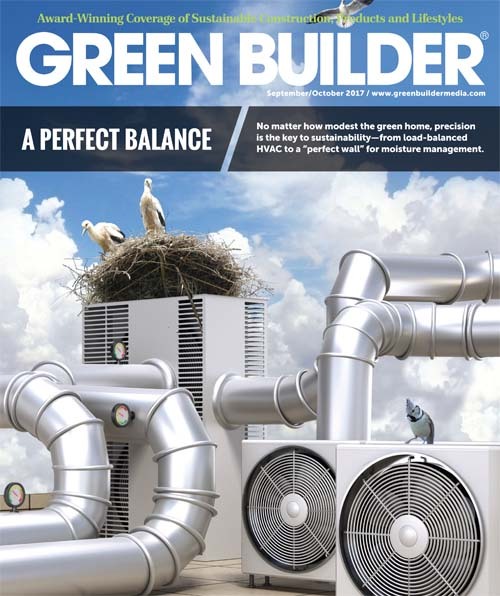 This month, Green Builder covers HVAC, the biggest energy user in a modern home. Keeping airflow balanced, optimized and efficient makes the most of conditioned air. But we’re also aware that you need to sell homes. And clients are trending toward concern with “wellness.” Their biggest concerns (and selling points) may include indoor air quality and comfort. There’s no reason building science can’t address these issues simultaneously, helping you sell homes while you make them more efficient.